Summing up the work of libertarian economist and historian Murray N. Rothbard (1926–1995) and noting its stunning range, philosopher David Gordon once wondered "if there are really three, four, or five geniuses writing under his name." 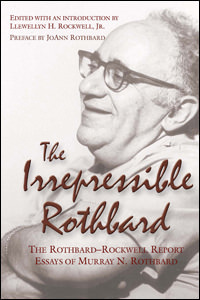 The lively essays collected in The Irrepressible Rothbard display one of those geniuses: Rothbard the journalist, cultural critic, political observer, and movement organizer. Even more remarkable, they represent just a fraction of what he wrote in his spare time, for just one publication, and in just the last few years of his life. His articles combined libertarian antigovernment economics, decentralist local patriotism, antiwar isolation, and a dissident/reactionary cultural outlook that saw the growth of government as the key to the loss of the Old Republic. He defended land-rights groups against environmentalists, citizen militias against gun grabbers, isolationists against imperialists, paleoconservatives against neoconservatives, populists against party regulars, anti–New World Order conspiracy theorists against the establishment, nationalists against internationalist planners, states' righters against libertarian centralists, the Christian Right against its own leadership, and much more. These essays show not only Rothbard's intellectual vigor but the complete joy with which he embraced life, and how his extreme optimism made even the most severe setbacks tolerable. He experienced great disappointments and great successes, but through it all he was heroic, undaunted, and irrepressible. U.S., Keep Out of Bosnia! But What About the Hungarians? Exhume! Exhume! Or, Who Put the Arsenic in Rough-n-Ready's Cherries? The Right to Kill, With Dignity? The Clintonians: "Looking Like America"
Do you ever watch the business news and think: what would Murray Rothbard say about this? Essays show forth not only Rothbard's intellectual vigor, but the complete joy with which he embraced life.